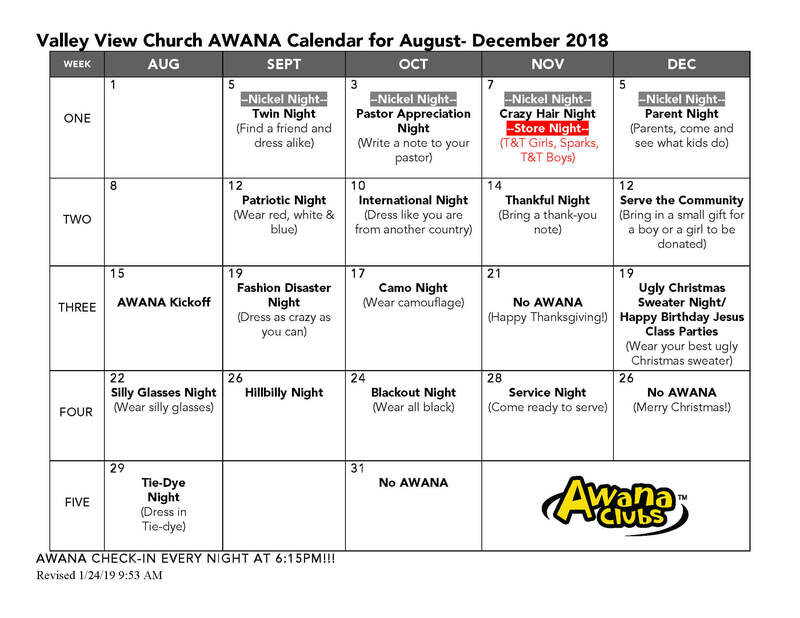 Awana is Valley View’s Wednesday night children’s program. Children ages 3 years to 5th grade come to learn God’s Word and fellowship with other children their age. 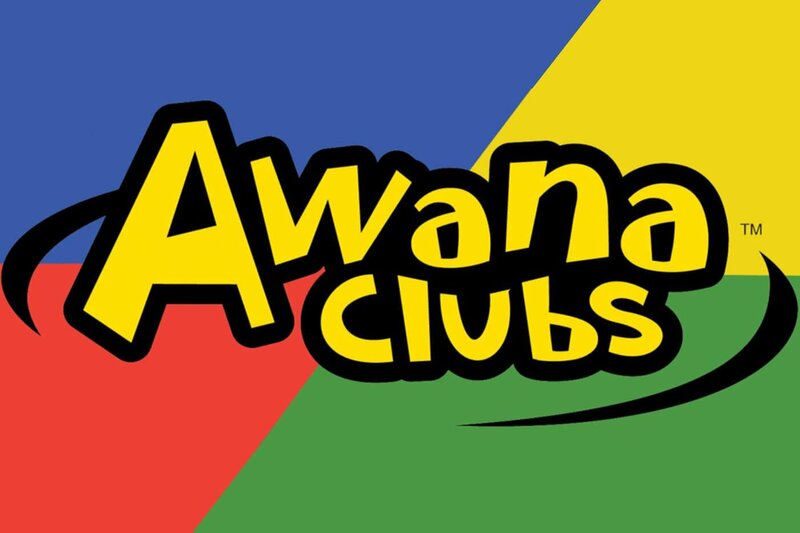 Awana begins at 6:15 pm and ends at 8:00pm. All the clubs have a great time learning God’s Word, storing it in their hearts, and fellowship with others their age. Puggles is our club for 2 year olds (children of volunteers only.) Our Puggles enjoy story time, puppet shows, playtime, snack time and handbook time. Children ages 3 – 4 are in Cubbies Clubs. Our Cubbies enjoy story time, puppet shows, playtime, snack time and handbook time. Children in grades K-2 are in Sparks Clubs. Our Sparks clubs enjoy opening ceremony, large group time, handbook time, and of course GAME time!!! Children in grades 3-5 are in T&T Boys and Girls Clubs. Our T&T clubs enjoy opening ceremony, large group time, handbook time, and of course GAME time!!! 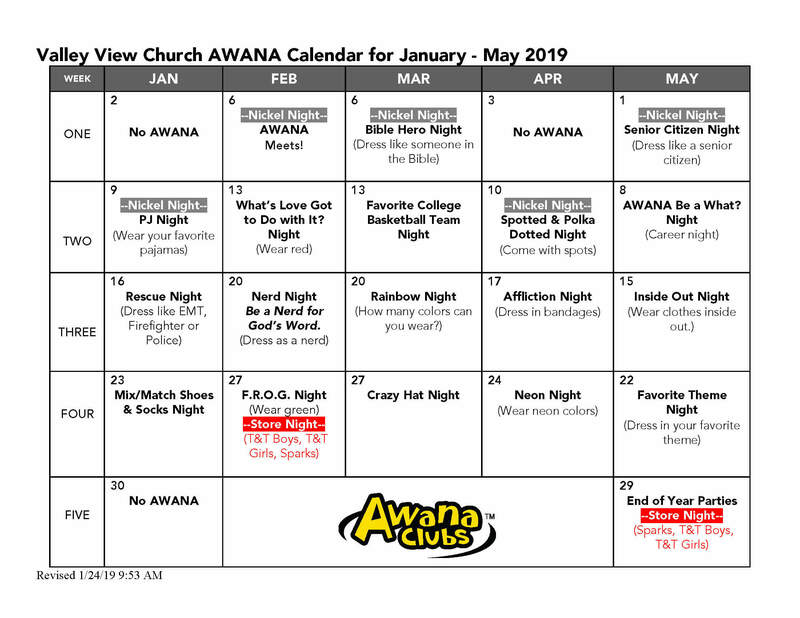 Click here to download a pdf copy of the AWANA calendar.